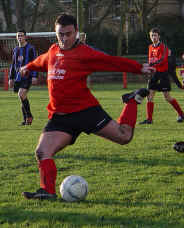 3 Ben Honeyman in action pictures. 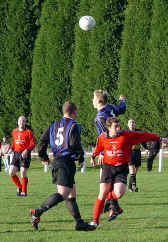 Blairwood park was the venue of this weeks match against Oakley United in the Whyte and Mackay East Super League. Only other match being played today was Arniston Rangers at home to Glenrothes. Port new a win was vital for their league challenge and started strongly for the opening 15 minutes with Derek Wemyss going close with a header from a corner on the right. 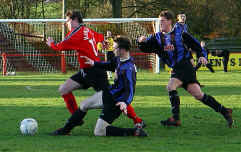 Oakley came close on 25 minutes with a right foot strike skimming past Frazer Fitzpatricks right hand upright. 28 minutes and the Port dugout were giving it peltters when a strong penalty claim was turned down by the officials. Port controlled most of the play in the opening period with a hard working Oakley defence the Port attack found them difficult to penetrate. Second half and Oakley found the stiff breeze in their favour and started to test the Tayport defence without creating many chances. 55 minutes and a VERY strong penalty claim was turned down when Sean Christie was sent tumbling to the ground while making a run to connect with a cross from the right. More weird decisions were to follow for both camps. 65 minutes and Oakley came close with a deflected shot heading out for a corner. 77 minutes and what looked like a goal bound header from Ben Honeyman inched over the crossbar. 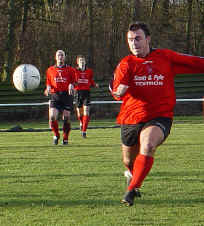 The match had 0-0 written all over it when in the 82nd minute Steven Stewart lined up a strike from 30 yards letting loose a left foot cannon which was curling away from the Oakley keeper ending up in the top right hand corner of the goal. Oakley tried hard to salvage a draw coming inches close with a header in the 91st minute which shave the crossbar. 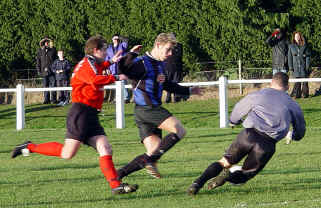 Port players and officials headed for the dressing room when the Arniston score came it a 0-0 draw allowing Port to leapfrog to the top of the Super League making it a good start to 2004. Happy New Year to all. F Fitzpatrick, R Gunnion, G Paterson, J Ward, D Wemyss, R Morris, S Stewart, B NcNaughton B Honeyman, S Christie, S Peters Subs Used G Dailly J Elliot.